Christian missiologists identify three responses to sin in human cultures: guilt, shame, and fear. These three moral emotions have become the foundation for three types of culture. Guilt-innocence cultures are individualistic societies (mostly Western), where people who break the laws are guilty and seek justice or forgiveness to rectify a wrong. Shame-honor cultures describe collectivistic cultures (common in the East), where people are shamed for not fulfilling group expectations and seek to restore their honor before the community. Fear-power cultures refer to animistic contexts (typically tribal), where people afraid of evil and harm pursue power over the spirit world through magical rituals. These three types of culture are like group personalities defining how people view the world. Just as individual people have a person-ality, cultural groups share a group-ality. Groupality refers an “organized pattern of behavioral characteristics of a group.” A person’s cultural type shapes their worldview, ethics, identity, and notion of salvation, even more than their individual personality does. So wouldn’t knowing the culture type of your host context be important for relationships and ministry? Although guilt, shame, and fear are three distinct cultural outlooks, no culture can be completely characterized by only one. These three dynamics interplay and overlap in all societies. 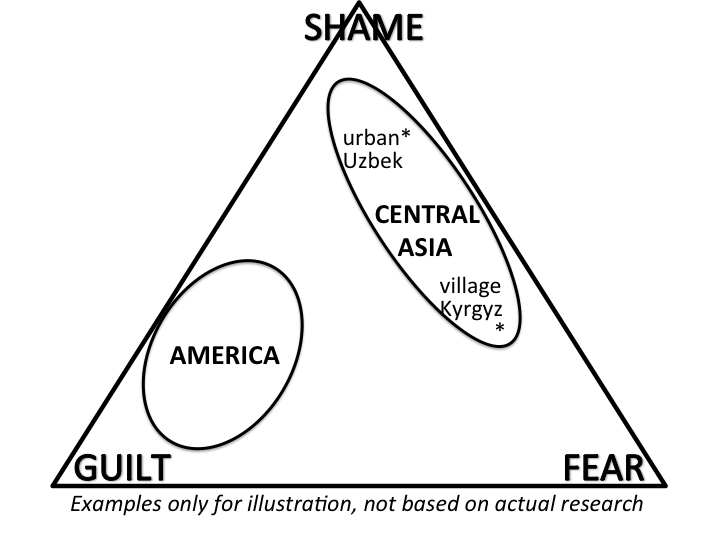 For example, Central Asian cultures integrate shame and fear dynamics. Even individuals or groups within a culture can vary. A rural Thai might be more fear-based than an urbanite in Bangkok. Young adults in America valuing authenticity and connection are becoming more shame-based. A more accurate model of culture measures the influence of each dynamic upon a group, like a triangle with each corner representing guilt, shame, or fear. A group’s cultural orientation, reflected by the position in the triangle, depends on how strongly each dynamic pulls upon the group. Each cultural worldview is a unique blend of guilt, shame, and fear. Like all cultural paradigms, the guilt-shame-fear trichotomy just simplifies complexities into basic categories to help us interpret world cultures. To learn the culture type of your group, take TheCultureTest.com – a FREE 5-minute survey. Learn how the gospel speaks to all cultures! 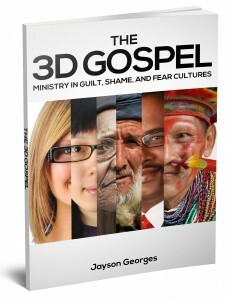 Order the concise book The 3D Gospel: Ministry in Guilt, Shame, and Fear Cultures on Amazon (for just $8.99 paperback, $3.99 Kindle). LeBron Dishonors (Touches) The Royal Princess! 3 Pings/Trackbacks for "Understanding Guilt, Shame, and Fear Cultures"